The battle of midway was the turning point of WWII in the Pacific Theatre of Operations. The Japanese objective of keeping the United States out of the war was not realized and, as a result, Japan lost the war. This battle was the turning point of the war for both Japan and America. This battle crippled much of the Japanese fleet, allowing the US to make a counter offensive that would end the war in the Pacific. A The Japanese had become the most powerful nation in Asia following the Russo-Japanese War (1904-05) and continued to be the most prominent nation until the conclusion of WWII in 1945. This was done by the Japan's recognition of Western technological supremacy during the late nineteenth century, and the drastic national changes it implemented to "catch up" with the west. Japan went from an agrarian, ancient society to a modern, industrial society in about two decades. This was only achieved because of the Japanese people's conviction not to be ruled by western powers. In order to change their society in this short a period, the Japanese cast off their cultural identity for the time being and embraced Western traditions, thought, and even fashion. It was this same conviction and national character that made the Japanese military so impressive in the early years of the twentieth century and, as Russia learned, so powerful. It wasn't until the end of the First World War when the Japanese became recognized as a world power, and by this time, they had their sights set on imperialism. After all, as the west had demonstrated in Asia, to be a truly powerful nation, you must have an empire. With this coming of age of Japan, there also came a time when they were evaluating there prospects around the world. When they set their sights on the south Pacific in the 1930's, they knew they would have to deal with the United States eventually, and began to prepare for a war with them. "By 1941 at least two decades had elapsed since the Japanese Imperial Navy, for the first time, singled out the U.S. Navy as its most likely enemy in the event of a war." (Willmott p.7) The Japanese knew that if any action was taken in the South Pacific, it was likely the U.S. could get involved, so for years before the outbreak of WWII, Japan was looking for a way to keep the U.S. out. The Imperial Navy had taken painstaking steps to prepare for a war with the U.S. It had constructed a fleet of the most advanced ships in the world at their time. They did this with the knowledge that the U.S. had the potential to beat them with pure quantity. Japan didn't have the resources to compete on an industrial level with the U.S., so the figured they would fight quantity with quality. The fleet constructed was an example of this mentality. The ships were more armed and faster than any other ships in the world. If Japan were to succeed against the U.S., they would have to do it with finesse, not brute strength. Japan, even with its military strength, was still unsure about war. There were many officials in Japan who believed a war with the U.S. was absolutely unwinnable. Admiral Isoroku Yamamoto, supreme commander of the Japanese Navy, was one of the people to express such doubts. Indeed, on paper, Japan could not compete with the U.S., however, proponents cited that on paper Japan was no match for Russia, but they one anyway. What worried the officials was that although this was true, they won by a very slim margin. Eventually, do to the support from many nationalistic factions in the government, and the Japanese people themselves, the decision to go to war eventually won out. There was a problem with this decision. Japan knew they had only a brief window of opportunity to complete their objectives before the U.S. would interfere. They estimated that, if they could wipe out the U.S. Pacific Fleet, they would have about two years before the U.S. could mobilize again. "In 1941 Japan chose to go to war with the most powerful maritime nations in the world, and her intention was to control the extent of the conflict by naval means." (Willmott p.17) The question arose, of how this could be done? When measuring a nations military power, most do it in terms of trained manpower, reserves, weaponry, and logistical support. Japan lacked manpower and reserves compared to the U.S., but they made up for that with attitude. The Japanese were a people that believed their country was protected by heaven. A belief that had been there since the Mongols tried to invade in 1276. They also believed in the divinity of their emperor, and direct descendant of the most powerful god Amaratsu. These beliefs lead Japan to believe they were unbeatable. This also led the people to remain extremely loyal to their leaders. Japan was a nationalistic nation with a strong military and a belief they could not be beat. The Japanese soldier embraced the spirit of the samurai, believing that in a fight, one fights to the death. The Japanese soldier would never give up. Having this knowledge, Japan believed that they could eventually wear down the U.S., and that ultimately, there numbers wouldn't matter as much. This was indeed an advantage of the Japanese military. However, it proved to work against them as time went on. The Japanese took up arms and began on their quest for imperialism. They began to attack and occupy islands around Japan, which prompted western powers to cut off trade with them. The west believed they were sending a clear message of disapproval to Japan, but what they really did was light a fire under Japan. This trade embargo caused a panic among top officials. Oil was a major trade commodity that Japan needed in order to make war. With this cut off, Japan saw the need to expand its empire in order to support itself. They did this by conquering most of the south pacific. Becoming more aggressive was the only way for them to support themselves. When Japan made its conquests, it was shocked at how easily they had come. They accomplished in a matter of weeks what they thought would take months to do. This supported Japanese invincibility mentality, and the decision to attack the U.S. was put into play. This fervor that overcame the Japanese has been labeled "victory disease" (Willmott p.34), and was the reason that Japan plunged headstrong into a war that many of them had previously thought they couldn't win. So the Japanese began to devise a plan to attack the U.S. in order to keep them from interfering with the Japanese agenda. This objective eventually culminated into the attack on Pearl Harbor. The Japanese believed that if they could launch a crushing blow to the U.S. Pacific Fleet, they would have enough time to finish their conquest of the South Pacific. They figured that once they had established an empire and stopped their expansion, the U.S. would simply let them stay where they were since they would no longer be showing expansionist tendencies. So, the Japanese set out for Pearl Harbor, after months of planning, and surprised the U.S. with a surprise attack that propelled the U.S. into WWII. The Japanese attack, however, was not a total success. In fact, it may have been considered a failure. Luckily for the U.S., a majority of it's fleet, including all aircraft carriers, were out to sea on maneuvers. The Japanese did manage to sink a number of battleships, however, at this time the carriers were the backbone of naval power, and the Japanese had failed to knock them out. Japan panicked. They had failed to give the U.S. a decisive blow that was to ensure they would stay out of the war. Instead, the U.S. began to mobilize, and this meant that time was running out for the Japanese. What were they to do now? There were intense debates among Japanese officials on what to do about this problem. Some said to continue with their plan, as if they had succeeded in stopping the U.S., but the more popular vote reflected the need to cripple the U.S. Navy as soon as possible. The Japanese began to work on a plan to destroy the remaining U.S. Fleet, unsure if it would be carried out, until the unthinkable happened. A couple of U.S. carriers stationed close to Japan attempted to launch a surprise attack of their own. Luckily for Japan, a fishing boat saw them and reported to Japanese Headquarters they were headed for Japan. Before Japan could do anything, They launched an air raid, dropping bombs on major Japanese Cities including Tokyo. Although this attack did very little damage, it scared the Japanese officials into agreeing that the U.S. needed to be dealt with. The plans for a second attack on the U.S. were underway. This plan called for a majority of the Japanese fleet to sail across the Pacific Ocean to the tiny island of Midway, and try and lure the U.S. out in order to finish off the remainder of their fleet. This plan was given the go ahead and the Japanese set out for Midway, the battle that was supposed to win the war for them. The U.S. wasn't ignorant to Japanese plans. After Pearl Harbor, the mobilization of the U.S. had been moved into high gear, and the U.S. was on their toes. The U.S. managed to intercept these Japanese plans by breaking the Japanese code. They weren't about to let another Pearl Harbor happen, and this time they would be prepared. The U.S. began to beef up its defenses of Midway, while the Navy devised a plan to beat Japan at their own game. 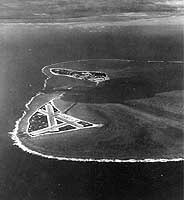 When the Japanese Fleet reached Midway, they would be greeted by U.S. bombers fixed upon their positions. Japan's confidence was about to be shattered. 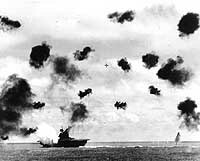 On June 4, 1942, The Japanese launched their attack on midway. They launched their first wave of fighters, who sped away to the island, while the Japanese fleet frantically looked for The U.S. Fleet. When the first wave of fighters reached Midway, they were met by hails of anti-aircraft fire, and U.S. fighters waiting for them. The Japanese were shocked to hear this. Before they could send out reinforcements, U.S. bombers began to strike. They devastated the Japanese Fleet crippling the carriers and sinking a number of ships. Japan was able to retaliate and managed to sink a few U.S. ships, but they had sustained too much damage to continue the battle. 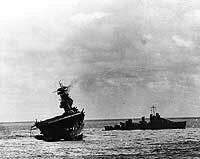 The Japanese Pacific Fleet had been almost destroyed, and the U.S. victory did the opposite the Japanese intended. They were the ones who's Navy was all but destroyed, and the tides of WWII turned in the favor of the U.S. The Japanese did not want to admit defeat, and at home, they claimed a partial victory. They reported that both sides received heavy losses, and people with the knowledge of the defeat remained silent in hopes of keeping morale high among the Japanese. These efforts ultimately failed, the U.S. was reporting a victory, and it wasn't long before the rest of Japan found out the truth. This had a tremendous psychological impact on the Japanese. Up until this point, they had come out of battle after battle unscathed. Now, they had suffered defeat, and their ego had been dealt a hard blow. Suddenly winning the war didn't seem realistic, and the prophecies of the critics of going to war with the U.S. had come true. With this, the Japanese slowly lost their foothold on the Pacific, and eventually, they lost the war. Both sides recognize The Battle of Midway as the most decisive battle in the Pacific Theatre of WWII. It was the turning point of the war, and the beginning of the end for the Japanese. The Barrier And The Javelin : Japanese And Allied Pacific Strategies, February To June 1942 / H.P. Willmott. Midway : The Battle That Doomed Japan : The Japanese Navy's Story / by Mitsuo Fuchida And Masatake Okumiya ; With An Introduction By Thomas B. Buell ; Edited By Clarke. Miracle At Midway / Gordon W. Prange, Donald M. Goldstein And Katherine V. Dillon. The Price Of Admiralty : War At Sea From Man Of War To Submarine / John Keegan.